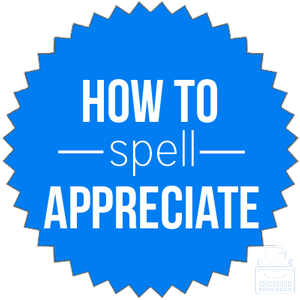 Spelling of Appreciate: Appreciate is spelled a-p-p-r-e-c-i-a-t-e. Definition of Appreciate: To appreciate something is to understand the significance, quality, or magnitude of it. If you appreciate something that someone has done for you, you are thankful for it and you show gratitude for it. Pronunciation of Appreciate: Appreciate is pronounced uh-pree-she-ate. What does appreciate mean? The word appreciate is a verb that can be used intransitively, though it’s usually used transitively. I really appreciate you getting me a gift, but you didn’t have to do this. As someone with very little, I feel that she never truly appreciated what she had. Appreciate also means to understand something or someone completely as with a heightened perception. It is something that you really have to see to appreciate. My son appreciates poetry like no other boy his age. To appreciate someone or something also means to value or admire highly. Another unrelated meaning of appreciate is to go up in value. This is in contrast to depreciation. This is the only car I would buy new because it will actually appreciate over time, while most others will not. It is better to spend your money on assets that will appreciate over time. (I) would appreciate it: to make a request politely; sometimes used sarcastically. I would appreciate it if you would send my condolences to your family. This word was first used in 1653, according to Merriam-Webster’s. Appreciate is from the Late Latin word appretiatus, which is the past participle of appretiare, from Latin ad– + pretium, meaning price. The following words can be substituted for appreciate where it is used to refer to something that becomes greater in worth or amount. Where it means to regard highly, the following words may replace appreciate. The following synonyms can be substituted for appreciate where it refers to perceiving something clearly. When appreciate is used to mean think highly or favorably of, the following words may be substituted. The word appreciate functions as a verb. It has several meanings, most of which are related to showing or having gratitude or esteem for someone or something.